Background: Although several tools to evaluate the credibility of health care guidelines exist, guidance on practical steps for developing guidelines is lacking. We systematically compiled a comprehensive checklist of items linked to relevant resources and tools that guideline developers could consider, without the expectation that every guideline would address each item. Methods: We searched data sources, including manuals of international guideline developers, literature on guidelines for guidelines (with a focus on methodology reports from international and national agencies, and professional societies) and recent articles providing systematic guidance. We reviewed these sources in duplicate, extracted items for the checklist using a sensitive approach and developed overarching topics relevant to guidelines. In an iterative process, we reviewed items for duplication and omissions and involved experts in guideline development for revisions and suggestions for items to be added. Results: We developed a checklist with 18 topics and 146 items and a webpage to facilitate its use by guideline developers. The topics and included items cover all stages of the guideline enterprise, from the planning and formulation of guidelines, to their implementation and evaluation. The final checklist includes links to training materials as well as resources with suggested methodology for applying the items. Interpretation: The checklist will serve as a resource for guideline developers. Consideration of items on the checklist will support the development, implementation and evaluation of guidelines. We will use crowdsourcing to revise the checklist and keep it up to date. Health care guidelines and their appropriate implementation are of interest to national organizations, professional societies, health care providers, policy-makers, patients and the public. Several tools to evaluate the credibility of existing health care guidelines are available,1–3 but guideline developers worldwide are struggling with the lack of guidance on practical steps, resources and tools to facilitate the development of trustworthy guidelines. However, while providing technical assistance to implement the national guideline development program with the WHO office in Estonia and the ministry of health in Saudi Arabia, and while initiating the DECIDE project (Developing and Evaluating Communication Strategies to Support Informed Decisions and Practice Based on Evidence),22 we recognized the need for facilitation of the steps to produce and implement guidelines. Our experience highlighted that, although manuals for single organizations are available, a comprehensive list of items and a portal for resources to consider in the planning, development, implementation, evaluation and updating of guidelines does not exist. Our objective was to systematically compile a comprehensive checklist of items and a portal for related resources that guideline developers, both newcomers and experts, could consider for all stages of the guideline enterprise, from the planning and formulation of recommendations, to their implementation, evaluation and updating. We also aimed to identify gaps in currently available processes and tools and provide a mechanism for filling these gaps. We sought to achieve a representative sample of source documents for review that would allow us to reach saturation for the checklist’s topics and items. We established the following eligibility criteria for data sources to be included, without restrictions on the date of publication: (a) documents described as “guidelines for guidelines,” guideline methodology reports or guideline manuals that were available from guideline developers, particularly international and national agencies, and professional societies; (b) documents that described the development process of health care guidelines, including clinical, public health and health systems guidelines; and (c) documents that, altogether, encompassed a global geographic perspective, including North America, South America, Europe, Asia and Australasia, and described the development process of guidelines produced for high-, middle- or low-income countries. In May 2013, we electronically searched the websites of guideline developers for methodology reports, guideline manuals and relevant supplementary manuals (e.g., guideline writing manuals, manuals for updating guidelines). When guideline manuals were not found online, we contacted the organizations directly to obtain them. As a final step, expert colleagues, researchers and other stakeholders in guideline development in our group (G.G., J.T., M.R., P.A.-C., R.H., S.L.N., S.T., A.O.) were involved in identifying important omissions and suggesting additional sources for inclusion. We did not conduct our own systematic review of electronic databases on guideline methodology because the guidelines for guidelines and methodology reports included in our list of sources were already informed by systematic reviews. One of us (W.W.) reviewed the initial list of sources for key guideline methodology reports and guidelines for guidelines. He extracted items and generated overarching topics to create a preliminary checklist. The checklist was reviewed for completeness (by H.J.S.). We then developed a form based on the preliminary checklist to extract data from each source document. Data abstractors (W.W., I.E., M.F., M.V., R.B.-P., K.-T.L., S.K., T.B., Y.Z., U.R., I.N.) worked in pairs to review the documents. They checked off and referenced items that were already included in the preliminary checklist, provided applicable revisions to the items and extracted new items. Given that our aim was comprehensiveness, any item discussed was eligible for inclusion in the checklist. The data abstractors were provided with an instruction sheet on how to review the source documents and a copy of the standardized abstraction form. The instructions and form were reviewed in a group discussion with the abstractors and then pilot tested in one round based on 4 examples before abstraction of all source documents. The instructions included notes to look for figures, flow diagrams, bullet points and descriptive text about the steps to follow to develop guidelines. The data abstractors were instructed to be inclusive when considering any new items to add to the checklist. The data abstractors reviewed the source documents, checking off existing items and suggesting new items, with a page reference. In addition, they identified references and links to available training tools and materials for the items, as well as resources with suggested methodology for applying the items in a guideline development process. The abstractors used the form to make comments about the wording of items, provide additional details for items and suggest placement of items under the specific topics. When one of a pair of abstractors suggested an item or checked off an existing item, it was included in the draft list of items. A third data abstractor confirmed that the item was discussed in the source document. Following data extraction, we were all invited to review the draft checklist, suggest revisions and approve the final draft. We consulted the guideline development experts in our group to provide additional suggestions and feedback about completeness of the checklist using a pilot-tested feedback form that contained the draft checklist. As a final step, 2 of us (M.V. and W.W.) reviewed 8 documents24–31 to determine whether saturation of checklist topics and items was reached. No new topics or items were identified, which indicated that we had reached saturation. Figure 1 summarizes the identification and selection of source documents. The initial list of 43 documents included key methodology reports,1–3,6,7,11,23 sources identified through discussions and email correspondence,20,24,25,27,28,30–55 and sources recommended by experts.5,26,29,56,57 Eight documents were excluded because the full-text version or manual could not be obtained.48–55 Of the remaining 35 documents, data were extracted from 27,1–3,5–7,11,20,23,32–47,56,57 and 8 were reviewed for saturation of topics and items.24–31 Potential checklist topics and items were obtained from 9 guideline methodology documents or document series and 18 guideline developer manuals (Box 1). Note: AGREE = Appraisal of Guidelines, Research and Evaluation. The list of items based on the initial abstraction included 19 topics and 123 items. Duplicate review of the 18 manuals revealed an additional 15 items, for a total of 138. After several iterations of the checklist were reviewed by the research team and the guideline development experts, we merged 2 topics, for a total of 18, and identified 8 additional items, for a total of 146. Box 2 lists the 18 topics with a description of how they fit into the guideline development process. The topics and items cover all stages of the guideline enterprise, from the planning and formulation of guidelines, to their dissemination, evaluation and updating. 1. Organization, budget, planning and training Involves laying out a general but detailed plan describing what is feasible, how it will be achieved and what resources are required to produce and use the guideline. The plan should refer to a specific period and be expressed in formal, measurable terms. 3. 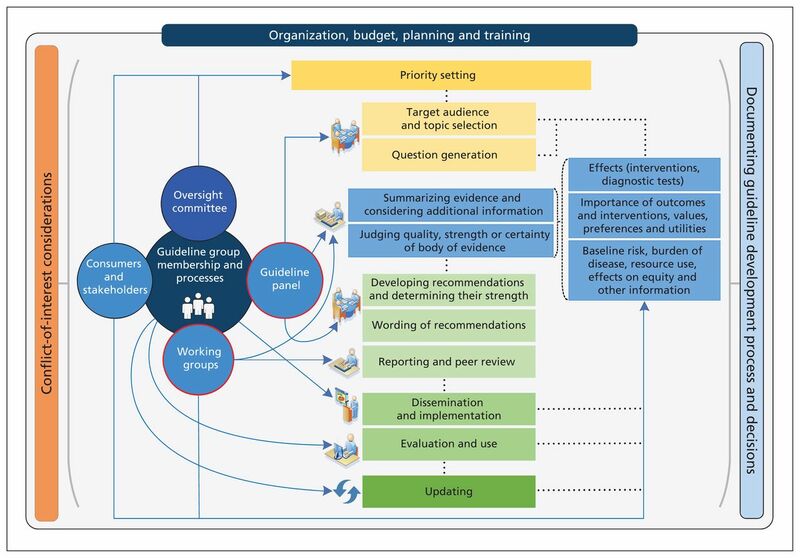 Guideline group membership Defines who is involved, in what capacity, and how the members are selected for the guideline development and at other steps of the guideline enterprise. 4. Establishing guideline group processes Defines the steps to be followed, how those involved will interact and how decisions will be made. 5. Identifying target audience and topic selection Involves describing the potential users or consumers of the guideline and defining the topics to be covered in the guideline (e.g., diagnosis of chronic obstructive pulmonary disease). 6. Consumer and stakeholder involvement Describes how relevant people or groups who are not necessarily members of the panel but are affected by the guideline (e.g., as target audience or users) will be engaged. 7. Conflict of interest considerations Focuses on defining and managing the potential divergence between an individual’s interests and his or her professional obligations that could lead to questioning whether the actions or decisions are motivated by gain, such as financial, academic advancement, clinical revenue streams or community standing. Financial or intellectual or other relationships that may affect an individual’s or organization’s ability to approach a scientific question with an open mind are included. 8. Question generation Focuses on defining key questions the recommendations should address using the PICO (patient/problem, intervention, comparison, outcome) framework, including the detailed population, intervention (including diagnostic tests and strategies) and outcomes that will be relevant for decision-making (e.g., should test A be used, or should treatments B, C, D or E be used in chronic obstructive pulmonary disease?). 9. Considering importance of outcomes and interventions, values, preferences and utilities Includes integrating, in the process of developing the guidelines, how those affected by its recommendations assess the possible consequences. These include patient, caregiver and health care provider knowledge, attitudes, expectations, moral and ethical values, and beliefs; patient goals for life and health; prior experience with the intervention and the condition; symptom experience (e.g., breathlessness, pain, dyspnea, weight loss); preferences for and importance of desirable and undesirable outcomes; perceived impact of the condition or interventions on quality of life, well-being or satisfaction, and interactions between the work of implementing the intervention, the intervention itself, and other contexts the patient may be experiencing; preferences for alternative courses of action; and preferences relating to communication content and styles, information and involvement in decision-making and care. This can be related to what in the economic literature is considered utilities. An intervention itself can be considered a consequence of a recommendation (e.g., the burden of taking a medication or undergoing surgery) and a level of importance or value is associated with that. 10. Deciding what evidence to include and searching for evidence Focuses on laying out inclusion and exclusion criteria based on types of evidence (e.g., rigorous research, informally collected), study designs, characteristics of the population, interventions and comparators, and deciding how the evidence will be identified and obtained. It also includes but is not limited to evidence about values and preferences, local data and resources. 11. Summarizing evidence and considering additional information Focuses on presenting evidence in a synthetic format (e.g., tables or brief narratives) to facilitate the development and understanding of recommendations. It also involves identifying and considering additional information relevant to the question under consideration. 12. Judging quality, strength or certainty of a body of evidence Includes assessing the confidence one can place in the obtained evidence by transparently evaluating the obtained research (individual studies and across studies) and other evidence applying structured approaches. This may include, but is not limited to, evidence about baseline risk or burden of disease, importance of outcomes and interventions, values, preferences and utilities, resource use (cost), estimates of effects and accuracy of diagnostic tests. 13. Developing recommendations and determining their strength Developing recommendations involves use of a structured analytic framework and a transparent and systematic process to integrate the factors that influence a recommendation. Determining the strength of the recommendations refers to judgments about how confident a guideline panel is that the implementation of a recommendation exerts more desirable than undesirable consequences. 14. Wording of recommendations and of considerations about implementation, feasibility and equity Refers to choosing syntax and formulations that facilitate understanding and implementation of the recommendations. Such wording is connected to considerations about implementation, feasibility and equity, which refer to the guideline panel’s considerations about how the recommendation will be used and what impact it may have on the factors described. 15. Reporting and peer review Reporting refers to how a guideline will be made public (e.g., print, online). Peer review refers to how the guideline document will be reviewed before its publication and how it can be assessed (e.g., for errors), both internally and externally, by stakeholders who were not members of the guideline development group. 16. Dissemination and implementation Focuses on strategies to make relevant groups aware of the guidelines and to enhance their uptake (e.g., publications and tools such as mobile applications). 17. Evaluation and use Refers to formal and informal strategies that allow judgments about: evaluation of the guidelines as a process and product; evaluation of the use or uptake, or both; and evaluation of impact and whether or not the guideline leads to improvement in patient or population health or other consequences. 18. Updating Refers to how and when a guideline requires revision because of changes in the evidence or other factors that influence the recommendations. Where identified, the checklist includes links to learning tools and training materials, as well as resources with suggested methodology for applying the items; it also identifies where gaps exist. Examples of learning tools and training materials include tutorials, readings and references (e.g., how certain organizations accomplish the step) that will assist guideline developers in aspects such as outlining the factors that may be considered in priority setting and topic selection, adhering to a conflict-of-interest policy and establishing an appropriate code of conduct for the guideline development group. Examples of resources for applying the items include methods, tools and references to assist developers in carrying out the steps, such as providing a disclosure-of-interest form, rating the strength of recommendations and adapting toolkits for guideline dissemination. Box 3 describes the final checklist (available at the end of the article). Although organization and priority setting precede most other steps, we agreed that a strict ordering of topics and items would be difficult to achieve. Guideline developers will often need to return to items mentioned in preceding topics or look ahead to subsequent items to enhance their understanding of a specific step in the guideline process. Figure 2 describes the interrelation of the various steps and topics and provides a graphical presentation of the guideline development process. In addition, we have compiled a glossary of key terms to help with the interpretation of the checklist (see Appendix 1, available at www.cmaj.ca/lookup/suppl/doi:10.1503/cmaj.131237/-/DC1). Finally, we have created an interactive version of the checklist for use by guideline developers (available at http://cebgrade.mcmaster.ca/guidecheck.html) that includes the suggested learning tools and resources for implementation that were identified. Diagram of the guideline development process. The steps and involvement of various members of the guideline development group are interrelated and not necessarily sequential. The guideline panel and supporting groups (e.g., methodologist, health economist, systematic review team and secretariat for administrative support) work collaboratively, informed through consumer and stakeholder involvement. They typically report to an oversight committee or board overseeing the process. For example, while deciding how to involve stakeholders early for priority setting and topic selection, the guideline group must also consider how developing formal relationships with the stakeholders will enable effective dissemination and implementation to support uptake of the guideline. Furthermore, considerations for organization, planning and training encompass the entire guideline development project, and steps such as documenting the methodology used and the decisions made, as well as considering conflicts of interest, occur throughout the process. The checklist is organized into 18 topics, each with corresponding items to consider. Users of the checklist should review all topics and items before applying them, because the items are not necessarily sequential and many are interconnected. The brief examples included with some items are for clarification and elaboration; they are not meant to be extensive instructions for how to accomplish the steps. Instructions and suggestions for accomplishing the steps can be found in the source documents referenced and in the resources suggested in the interactive online version of the checklist (http://cebgrade.mcmaster.ca/guidecheck.html). See Appendix 1 (available at www.cmaj.ca/lookup/suppl/doi:10.1503/cmaj.131237/-/DC1) for a glossary of terms appearing in the checklist. Note: E = item informed by expert consultation, GRADE = Grading of Recommendations Assessment, Development and Evaluation. Based on a thorough review of available sources for guideline developers, we have developed a comprehensive checklist of practical steps with 146 items arranged under 18 topics for consideration in the context of guideline development. The list, which defines the complete guideline process, is not intended to evaluate the credibility of a guideline or to describe the minutiae of the steps to take (e.g., how to conduct a systematic review to support a specific recommendation). Its purpose is to function as a publicly available and interactive resource, with links to learning tools and training materials, for those interested in beginning, enhancing or evaluating their guideline development process. Although many manuals for guideline development exist, our checklist of items is free of institutional or organizational constraints. The main strength of this study is the extent of our review of key sources in this field. In addition, the experience some of us had over the years in using various manuals for guideline development facilitated the identification of gaps and relevant resources. A potential limitation of our checklist is that it is lengthy. However, the list is intended to be generic, to cover all topics and items that should be considered when developing a guideline, and to be applicable to a variety of guidelines, including clinical, policy and public health guidelines. Those planning to use the checklist should keep that in mind and ignore steps that might not be relevant to their topic or area, although many of the items will be essential for producing guidelines that will be judged trustworthy. Another potential limitation is that the checklist appears to give equal weight to each step. Guideline developers face challenges of limited time, funding and human resources and often need to prioritize one step over another. Having a comprehensive checklist will allow developers to be explicit about which steps they want to prioritize and why. The field of guideline development is constantly evolving, particularly in areas that lack more formal guidance, such as incorporation of the relative importance of outcomes and interventions, and patient values and preferences. We used current guideline manuals and methodology reports to develop the checklist; therefore, areas that lack formal guidance may not be well covered in the checklist. In addition, we have only begun to evaluate the checklist with guideline developers who were not involved in its development (e.g., in a project focusing on rare diseases [www.rarebestpractices.eu]). However, we will solicit feedback from users of the online version of the checklist and use it to revise the checklist and keep it up to date. Our checklist represents a comprehensive list of items to consider during the development of guidelines. Although the checklist covers all stages in the guideline process, from planning to implementation of a guideline, there are several areas in the guideline enterprise for which further guidance is needed, as shown by the deficiency of detail about specific items we identified. 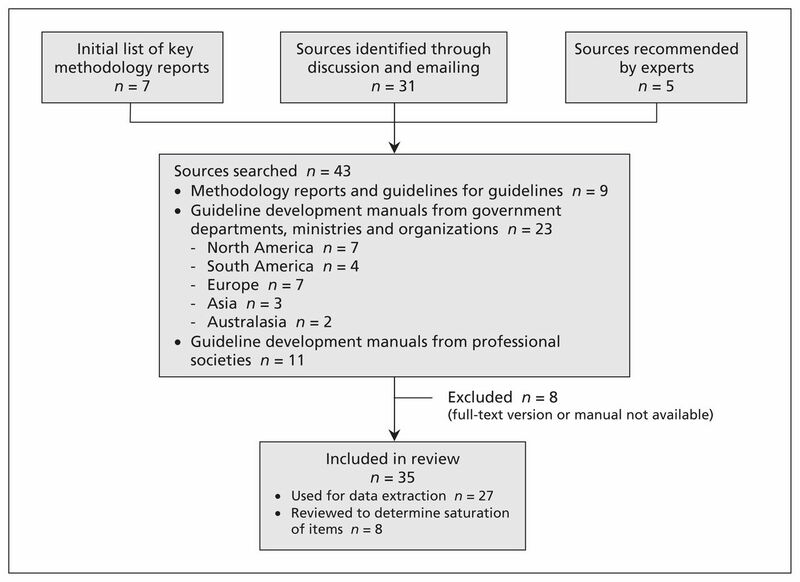 Current guidelines for guidelines and guideline development manuals place a heavy focus on systematic reviews of the evidence and clinical outcomes, whereas less attention is paid to providing guidance on considering resource use, patients’ and consumers’ values and preferences, and equity. Similarly, there are several areas for which training tools and resources for implementation of the steps are lacking. Manuals describe the overall steps and considerations needed in developing guidelines, but specific details about how the process is accomplished are often omitted. Details about guideline group interaction and group processes such as conflict resolution may be internally documented, but support through tools or learning materials would be useful to individuals seeking instruction for developing their own guidelines. Moreover, instructions about the practical steps and processes for guideline development would ensure consistency among different guideline groups within an organization. Our checklist focuses on the processes and practical steps of guideline development. The checklist is intended for use by guideline developers to plan and track the process of guideline development and to help the developers ensure that no key steps are missed. Guideline developers may, with justification, skip items that may not be applicable to the specific guideline or the organization. However, following the steps will ensure that key items are covered and increase the likelihood of the guideline achieving higher scores when evaluated with credibility assessment tools. Users of the checklist should become familiar with the topics and items before applying them and realize that the items are interrelated and not necessarily sequential (Figure 2). As part of our work with the Grading of Recommendations Assessment, Development and Evaluation (GRADE) Working Group (www.gradeworkinggroup.org) and the DECIDE project (www.decide-collaboration.eu), we will implement this checklist in our electronic, Web-based Guideline Development Tool (www.guidelinedevelopment.org), freely available to nonprofit organizations. Future work will focus on our obtaining additional feedback through crowdsourcing, keeping this checklist up to date and providing further practical, training and learning resources on our interactive website (http://cebgrade.mcmaster.ca/guidecheck.html) and the electronic Guideline Development Tool. This work will include more formal testing and assessment of which steps are proving to be most time and resource intensive. The authors thank Charmaine Fraser for her administrative assistance. Competing interests: None declared. Authors of this manuscript have been involved in the development of various guideline manuals which are referenced in this article. Contributors: Holger Schünemann was the study supervisor, had full access to all the data in the study and takes responsibility for the integrity of the data and the accuracy of the data analysis. Holger Schünemann, Wojtek Wiercioch, Itziar Etxeandia, Maicon Falavigna, Reem Mustafa, Matthew Ventresca, Romina Brignardello-Petersen, Kaja-Triin Laisaar, Sérgio Kowalski, Tejan Baldeh, Yuan Zhang, Ulla Raid, Ignacio Neumann, Susan Norris, Judith Thornton, Robin Harbour, Shaun Treweek, Gordon Guyatt, Pablo Alonso-Coello, Andrew Oxman and Elie Akl contributed to the acquisition of data. All of the authors contributed to the analysis and interpretation of data. Holger Schünemann and Wojtek Wiercioch drafted the manuscript; all of the authors revised the manuscript critically for important intellectual content and approved the final version submitted for publication. Funding: This study was supported by funds from McMaster University. Holger Schünemann, Judith Thornton, Robin Harbour, Shaun Treweek, Pablo Alonso-Coello, Jan Brošek and Andrew Oxman received funding from the European Union FP7 Programme (grant no. 258583) as part of the DECIDE (Developing and Evaluating Communication Strategies to Support Informed Decisions and Practice Based on Evidence) project.
. AGREE II: advancing guideline development, reporting and evaluation in health care. CMAJ 2010;182:E839–42.
. Guidelines International Network: toward international standards for clinical practice guidelines. Ann Intern Med 2012;156:525–31. ., editors; Committee on Standards for Developing Trustworthy Clinical Practice Guidelines. Clinical practice guidelines we can trust. Washington (DC): National Academies Press; 2011. Available: www.nap.edu/openbook.php?record_id=13058 (accessed 2013 Apr. 22).
. Methods for developing evidence-based recommendations by the Advisory Committee on Immunization Practices (ACIP) of the US Centers for Disease Control and Prevention (CDC). Vaccine 2011; 29:9171–6.
. Methodology for the development of antithrombotic therapy and prevention of thrombosis guidelines: Antithrombotic Therapy and Prevention of Thrombosis, 9th ed: American College of Chest Physicians Evidence-Based Clinical Practice Guidelines. Chest 2012;141(2 Suppl):53S–70S.
. Improving the use of research evidence in guideline development: introduction. Health Res Policy Syst 2006;4:12.
. Developing clinical practice guidelines: target audiences, identifying topics for guidelines, guideline group composition and functioning and conflicts of interest. Implement Sci 2012;7:60.
. Developing clinical practice guidelines: types of evidence and outcomes; values and economics, synthesis, grading, and presentation and deriving recommendations. Implement Sci 2012;7:61.
. Developing clinical practice guidelines: reviewing, reporting, and publishing guidelines; updating guidelines; and the emerging issues of enhancing guideline implementability and accounting for comorbid conditions in guideline development. Implement Sci 2012;7:62.
. Transparent development of the WHO rapid advice guidelines. PLoS Med 2007;4:e119.
. A guide to guidelines for professional societies and other developers of recommendations: introduction to integrating and coordinating efforts in COPD guideline development. An official ATS/ERS workshop report. Proc Am Thorac Soc 2012;9:215–8. , editors; Committee to Advise the Public Health Service on Clinical Practice Guidelines. Clinical practice guide-lines: directions for a new program. Washington (DC): National Academy Press; 1990. Available: www.nap.edu/openbook.php?record_id=1626 (accessed 2013 Apr. 22).
. Grading quality of evidence and strength of recommendations. BMJ 2004;328:1490.
. Going from evidence to recommendations. BMJ 2008;336:1049–51.
. Incorporating considerations of resources use into grading recommendations. BMJ 2008; 336:1170–3.
. What is “quality of evidence” and why is it important to clinicians? BMJ 2008;336: 995–8.
. GRADE: an emerging consensus on rating quality of evidence and strength of recommendations. BMJ 2008;336:924–6.
. Use of GRADE grid to reach decisions on clinical practice guidelines when consensus is elusive. BMJ 2008;337:a744.
. Grading quality of evidence and strength of recommendations for diagnostic tests and strategies [published erratum in BMJ 2008;24:336]. BMJ 2008;336:1106–10.
. Estonian handbook for guidelines development. Geneva (Switzerland): World Health Organization; 2011. Available: whqlibdoc.who.int/publications/2011/9789241502429_eng.pdf (accessed 2013 Apr. 22).
. Editorial: Can China master the guideline challenge? Health Res Policy Syst 2013;11:1.
. Developing and evaluating communication strategies to support informed decisions and practice based on evidence (DECIDE): protocol and preliminary results. Implement Sci 2013;8:6.
. Standardized reporting of clinical practice guidelines: a proposal from the Conference on Guideline Standardization. Ann Intern Med 2003; 139:493–8. Clinical practice guideline process manual, 2011 ed. St. Paul (MN): American Academy of Neurology; 2011. Available: www.aan.com/Guidelines/Home/Development (accessed 2013 Apr. 22). Practice guidelines and technical standards handbook. Reston (VA): American College of Radiology; 2011. Available: www.acr.org/~/media/ACR/Documents/PGTS/DevelopmentHandbook.pdf (accessed 2013 June 26). Policy and procedure manual for clinical practice guidelines. Atlanta (GA): American College of Rheumatology; 2012. Available: www.rheumatology.org/Practice/Clinical/Guidelines/Clinical_Practice_Guidelines (accessed 2013 July 5). American Society of Clinical Oncology guideline procedures manual: expert panel version 4.0. Alexandria (VA): American Society of Clinical Oncology; 2011. Available: www.asco.org/sites/default/files/methodology_manual_1.25.11_0.pdf (accessed 2013 Apr. 22). Overview: standard operating procedures. Linthicum (MD): American Urological Association; 2011. Available: www.auanet.org/common/pdf/education/Guidelines-SOP.pdf. (accessed 2013 Apr. 22). Principles for the development of specialty society clinical guidelines. Chicago (IL): Council of Medical Specialty Societies; 2012. Available: www.cmss.org/DefaultTwoColumn.aspx?id=505 (accessed 2013 July 5). Let Evidence Guide Every New Decision (LEGEND) evidence-based care guideline development and update process. Cincinnati (OH): Cincinnati Children’s Hospital Medical Center Evidence-Based Care Group; 2006. Available: www.cincinnatichildrens.org/service/j/anderson-center/evidence-based-care/legend (accessed 2013 Apr. 22). Methodology manual and policies from the ACCF/AHA Task Force on Practice Guidelines. Washington (DC): American College of Cardiology Foundation/Dallas (TX): American Heart Association; 2010. Available: my.americanheart.org/professional/StatementsGuidelines/PoliciesDevelopment/Development/Methodologies-and-Policies-from-the-ACCAHA-Task-Force-on-Practice-Guidelines_UCM_320470_Article.jsp (accessed 2013 Apr. 2). Canadian Task Force on preventive health care procedure manual. Edmonton (AB): Canadian Task Force on Preventive Health Care; 2011. Available: canadiantaskforce.ca/methods/methods-manual/ (accessed 2013 Apr. 22). Program in evidence-based care handbook. Hamilton (ON): Cancer Care Ontario; 2012. Available: www.cancercare.on.ca/about/programs/pebc/pebc-products/ (accessed 2013 Apr. 22). Guidelines and recommendations: a CDC primer. Atlanta (GA): Office of the Associate Director for Science Centers for Disease Control and Prevention; 2012.
. Transparency matters: Kaiser Permanente’s National Guideline Program methodological processes. Perm J 2012;16:55–62. US preventive services task force procedure manual. Rockville (MD): Agency for Healthcare Research and Quality; 2008. Available: www.uspreventiveservicestaskforce.org/uspstf08/methods/procmanual.htm (accessed 2013 Apr. 22).
. Guía para la adaptación de guías de práctica clínica. Buenos Aires (Argentina): Academia Nacional de Medicina Buenos Aires; 2008. Available: publicaciones.ops.org.ar/publicaciones/otras%20pub/GuiadeGuias.pdf (accessed 2013 Apr. 22).
. Guía metodológica para la elaboración de guías de atención integral en el sistema general de seguridad social en salud colombiano. Bogotà (Colombia): Ministerio de la Protección Social; 2010. Available: www.minsalud.gov.co/Documentos%20y%20Publicaciones/GUIA%20METODOLOGICA%20PARA%20LA%20ELABORACI%C3%93N%20DE%20GU%C3%8DAS%20DE%20ATENCI%C3%93N%20INTEGRAL.pdf (accessed 2013 Apr. 22). Norma técnica para la elaboración de guías de practica clinica. Lima (Perú): Ministerio de Salud de Perú; 2005. Available: bvs.minsa.gob.pe/local/MINSA/1176_DGSP196.pdf (accessed 2013 Apr. 22). Recommendations for guidelines production. Sophia Antipolis (France): European Society of Cardiology; 2010. Available: www.escardio.org/guidelines-surveys/esc-guidelines/about/Pages/rules-writing.aspx (accessed 2013 Apr. 22). The guidelines manual. London (UK): National Institute for Health and Clinical Excellence; 2012. Available: publications.nice.org.uk/the-guidelines-manual-pmg6 (accessed 2013 Apr. 22). SIGN 50: a guideline developer’s handbook.Edinburgh (UK): Scottish Intercollegiate Guidelines Network; 2011. Available: www.sign.ac.uk/guidelines/fulltext/50/ (accessed 2013 Apr. 22). Elaboración de guías de práctica clínica en el sistema nacional de salud: manual metodológico. Zaragoza (Spain): Ministerio de Sanidad y Consumo; 2007. Available: www.guiasalud.es/emanuales/elaboracion/index-02.html (accessed 2013 Apr. 22). WHO handbook for guideline development. Geneva (Switzerland): World Health Organization; 2012. Available: apps.who.int/iris/bitstream/10665/75146/1/9789241548441_eng.pdf (accessed 2013 Apr. 22). Procedures and requirements for meeting the 2011 NHMRC standard for clinical practice guidelines. Canberra (Australia): National Health and Medical Research Council; 2011. Available: www.nhmrc.gov.au/guidelines/publications/cp133-and-cp133a (accessed 2013 Apr. 22). Handbook for the preparation of explicit evidence-based clinical practice guidelines. Wellington (New Zealand): New Zealand Guidelines Group; 2001. Clinical practice guidelines. Kuala Lampur (Malaysia): Academy of Medicine of Malaysia; 2013. Available: www.acadmed.org.my/index.cfm?&menuid=67 (accessed 2013 Apr. 22). Ministry of Health Labour and Welfare website. Tokyo (Japan): Ministry of Health Labour and Welfare; 2013. Available: www.mhlw.go.jp/english (accessed 2013 Apr. 22). Ministry of Health Republic of Indonesia website. Jakarta (Indonesia): Ministry of Health Republic of Indonesia; 2013. Available: www.depkes.go.id/index.php?In=LG-2 (accessed 2013 Apr. 22). Guidelines [in Turkish]. Ankara (Turkey): Republic of Turkey Ministry of Health; 2013. Available: www.saglik.gov.tr/TR/belge/1-339/yonergeler.html (accessed 2013 Apr. 22). Clinical practice guidelines. Santiago (Chile): Chile Ministry of Health; 2013. Available: www.minsal.gob.cl/portal/url/page/minsalcl/g_gesauge/guias.html (accessed 2013 Apr. 22). Guidance. Stockhom (Sweden): European Center for Disease Prevention and Control; 2013. Available: www.ecdc.europa.eu/en/publications/guidance/Pages/index.aspx (accessed 2013 Apr. 22). Systematic evidence reviews and clinical practice guidelines. Bethesda (MD): National Heart Lung and Blood Institute; 2013. Available: www.nhlbi.nih.gov/guidelines/index.htm (accessed 2013 Apr. 22). Clinical guidelines portal [federally approved HIV/AIDS medical practice guidelines]. Rockville (MD): AIDSinfo; US Department of Health and Human Services. Available: aidsinfo.nih.gov/guidelines (accessed 2013 Apr. 22).
. Clinical practice guide-line development manual, third edition: a quality-driven approach for translating evidence into action. Otolaryngol Head Neck Surg 2013;148(1 Suppl):S1–S55. ADAPTE Collaboration. The ADAPTE process: resource toolkit for guideline adaptation. Version 2.0. Berlin (Germany): Guideline International Network; 2009. Available: www.g-i-n.net/document-store/working-groups-documents/adaptation/adapte-resource-toolkit-guideline-adaptation-2-0.pdf (accessed 2013 July 5). Manuscript development process. Washington (DC): American College of Cardiology Foundation/Dallas (TX): American Heart Association; 2010. Available: my.americanheart.org/professional/StatementsGuidelines/PoliciesDevelopment/Policies-Development_UCM_316897_Article.jsp (accessed 2013 Apr. 22). Supplementary methodology manual for AHA stroke council guideline writing groups. Dallas (TX): American Heart Association Stroke Council; 2010. Available: my.americanheart.org/professional/StatementsGuidelines/PoliciesDevelopment/Policies-Development_UCM_316897_Article.jsp (accessed 2013 Apr. 22).
. ACCF/AHA clinical practice guideline methodology summit report: a report of the American College of Cardiology Foundation/American Heart Association Task Force on Practice Guidelines. J Am Coll Cardiol 2013;61:213–65. Program in evidence-based care document assessment and review protocol. Hamilton (ON): Cancer Care Ontario; 2012. Available: www.cancercare.on.ca/about/programs/pebc/document__review/ (accessed 2013 Apr. 22). Program in evidence-based care conflict of interest policy. Hamilton (ON): Cancer Care Ontario; 2011. Available: www.cancercare.on.ca/cms/one.aspx?objectId=7582&contextId=1377 (accessed 2013 Apr. 22). The guidelines manual: appendix A – agreements and advice for guideline development group members. London (UK): National Institute for Health and Clinical Excellence; 2012. Available: publications.nice.org.uk/pmg6a (accessed 2013 Apr. 22). How NICE clinical guidelines are developed: an overview for stakeholders, the public and the NHS. 5th ed. London (UK): National Institute for Health and Clinical Excellence; 2012. Available: publications.nice.org.uk/pmg6f (accessed 2013 Apr. 22). Positively equal: a guide to addressing equality issues in developing clinical guidelines. London (UK): National Institute for Health and Clinical Excellence; 2012. Available: www.nice.org.uk/aboutnice/howwework/developingniceclinicalguidelines/PositivelyEqual.jsp (accessed 2013 July 5). Guideline development and conflicts of interest: identifying and managing conAicts of interest of prospective members and members of NHMRC committees and working groups developing guidelines. Canberra (Australia): National Health and Medical Research Council; 2012. Available: www.nhmrc.gov.au/guidelines-and-publications/information-guideline-developers/guideline-development-and-conflicts (accessed 2013 Apr. 22).
. Development of the AGREE II, part 1: performance, usefulness and areas for improvement. CMAJ 2010;182:1045–52.
. Development of the AGREE II, part 2: assessment of validity of items and tools to support application. CMAJ 2010;182:E472–8. COGS: the conference on guideline standardization. New Haven (CT): Yale Center for Medical Informatics; 2003. Available: gem.med.yale.edu/cogs/statement.do (accessed 2013 Apr. 22).
. Improving the use of research evidence in guideline development: 1. Guidelines for guidelines. Health Res Policy Syst 2006;4:13.
. Improving the use of research evidence in guideline development: 2. Priority setting. Health Res Policy Syst 2006;4:14.
. Improving the use of research evidence in guideline development: 3. Group composition and consultation process. Health Res Policy Syst 2006;4:15.
. Improving the use of research evidence in guideline development: 4. Managing conflicts of interests. Health Res Policy Syst 2006;4:16.
. Improving the use of research evidence in guideline development: 5. Group processes. Health Res Policy Syst 2006;4:17.
. Improving the use of research evidence in guideline development: 6. Determining which outcomes are important. Health Res Policy Syst 2006;4:18.
. Improving the use of research evidence in guideline development: 7. Deciding what evidence to include. Health Res Policy Syst 2006;4:19.
. Improving the use of research evidence in guideline development: 8. Synthesis and presentation of evidence. Health Res Policy Syst 2006;4:20.
. Improving the use of research evidence in guideline development: 9. Grading evidence and recommendations. Health Res Policy Syst 2006;4:21.
. Improving the use of research evidence in guideline development: 10. Integrating values and consumer involvement. Health Res Policy Syst 2006;4:22.
. Improving the use of research evidence in guideline development: 11. Incorporating considerations of cost-effectiveness, affordability and resource implications. Health Res Policy Syst 2006;4:23.
. Improving the use of research evidence in guideline development: 12. Incorporating considerations of equity. Health Res Policy Syst 2006;4:24.
. Improving the use of research evidence in guideline development: 13. Applicability, transferability and adaptation. Health Res Policy Syst 2006;4:25.
. Improving the use of research evidence in guideline development: 14. Reporting guidelines. Health Res Policy Syst 2006;4:26.
. Improving the use of research evidence in guideline development: 15. Disseminating and implementing guidelines. Health Res Policy Syst 2006;4:27.
. Improving the use of research evidence in guideline development: 16. Evaluation. Health Res Policy Syst 2006;4:28.
. Identifying target audiences: Who are the guidelines for? : article 1 in integrating and coordinating efforts in COPD guideline development. An official ATS/ERS workshop report. Proc Am Thorac Soc 2012;9:219–24.
. Priority setting in guideline development: article 2 in integrating and coordinating efforts in COPD guideline development. An official ATS/ERS workshop report. Proc Am Thorac Soc 2012;9:225–8.
. Guideline group composition and group processes: article 3 in integrating and coordinating efforts in COPD guideline development. An official ATS/ERS workshop report. Proc Am Thorac Soc 2012;9:229–33.
. Guideline funding and conflicts of interest: article 4 in integrating and coordinating efforts in COPD guideline development. An official ATS/ERS workshop report. Proc Am Thorac Soc 2012;9:234–42.
. Deciding what type of evidence and outcomes to include in guidelines: article 5 in integrating and coordinating efforts in COPD guideline development. An official ATS/ERS workshop report. Proc Am Thorac Soc 2012;9:243–50.
. Incorporating considerations of cost-effectiveness, affordability, and resource implications in guideline development: article 6 in integrating and coordinating efforts in COPD guideline development. An official ATS/ERS workshop report. Proc Am Thorac Soc 2012;9:251–5.
. Synthesis, grading, and presentation of evidence in guidelines: article 7 in integrating and coordinating efforts in copd guideline development. An official ATS/ERS workshop report. Proc Am Thorac Soc 2012;9:256–61.
. Integrating values and consumer involvement in guidelines with the patient at the center: article 8 in integrating and coordinating efforts in COPD guideline development. An official ATS/ERS workshop report. Proc Am Thorac Soc 2012;9:262–8.
. Stakeholder involvement: how to do it right: article 9 in integrating and coordinating efforts in COPD guideline development. An official ATS/ERS workshop report. Proc Am Thorac Soc 2012;9:269–73.
. How to integrate multiple comorbidities in guideline development: article 10 in integrating and coordinating efforts in COPD guideline development. An official ATS/ERS workshop report. Proc Am Thorac Soc 2012; 9:274–81.
. Moving from evidence to developing recommendations in guidelines: article 11 in integrating and coordinating efforts in COPD guideline development. An official ATS/ERS workshop report. Proc Am Thorac Soc 2012;9:282–92.
. Reporting and publishing guidelines: article 12 in integrating and coordinating efforts in COPD guideline development. An official ATS/ERS workshop report. Proc Am Thorac Soc 2012;9:293–7.
. Disseminating and implementing guidelines: article 13 in integrating and coordinating efforts in COPD guideline development. An official ATS/ERS workshop report. Proc Am Thorac Soc 2012;9:298–303.
. Adaptation, evaluation, and updating of guidelines: article 14 in integrating and coordinating efforts in COPD guideline development. An official ATS/ERS workshop report. Proc Am Thorac Soc 2012;9:304–10. Health systems strengthening glossary. Geneva (Switzerland): World Health Organization; 2013. Available: www.who.int/healthsystems/hss_glossary/en/index.html (accessed 2013 July 26). Institute of Medicine Committee on Methods for Setting Priorities for Guidelines Development. Setting priorities for clinical practice guidelines. Washington (DC): National Academy Press; 1995.
. Toward a procedure for integrating moral issues in health technology assessment. Int J Technol Assess Health Care 2005;21:312–8.